Promoting your brand can seem like a hassle and you may ask yourself how useful is it really to print your company’s logo on some tchotchkes? It turns out it can be very useful. Printing your logo on a commonly used item is a great marketing ploy because every time your clients reach for the item they will be reminded, at least subconsciously, of your brand. Particularly useful items that people will use again and again will have that many more opportunities to stamp your marketing message on their mind and increase your brand recognition. Creating a stellar promotional item is more than just picking a neat or practical item and slapping your logo on it. Think about items your customer base will be interested in or have a need for and will find value or use in. Also think about the materials the product is made from and how that will shape people’s opinion of the item and by extension your company. Give your next marketing item a boost by aligning your brand with environmental causes. Sustainability and eco awareness are issues a lot of people are very passionate about. The environment is a natural resource that we have been pushing around for a while now and unless we start changing our ways we are dangerously close to doing some irreparable damage. Imprinting your company’s logo or a marketing message on an eco-friendly promotional item, like a custom aluminum water bottle or shopping bag made from sustainable materials, is a great way to get your brand noticed all while doing right by the environment. This move also shows your clients (and prospective clients) that your company cares and has a stake in the shared future of our planet. Reusable products, particularly grocery bags have been picking up steam lately as an eco-savvy way to carry groceries home, or in areas hit by a disposable bag ban, the only way to carry goods home. Reusable water bottles have also earned a reputation as an ecological alternative to single use plastic bottles that can result in litter and environmental harm. Whether used by choice or need, eco-friendly marketing items spread the obvious message about your brand, but they also spread the word that your organization is aware and concerned about your impact on the environment. Reusable shopping and grocery bags do the job of single use disposable bags without the negative effects on the environment. Some shoppers decide to use these eco-friendly alternatives because they choose to manage their impact on the environment while bans in some municipalities can dictate whether other shoppers go the reusable or disposable route. Plastic bags commonly end up as litter or they find their way into a landfill which isn’t a great solution since they are not biodegradable and they just take up space. Aside from being an eyesore plastic bags can clog drainage systems and pose a serious health risk to animals, who may mistake the rubbish for food. Once animals ingest plastic bags it typically results in a painful and unnecessary death. These issues are usually the foundation of the numerous disposable bag bans sweeping the country. Take advantage of these bans and offer your customers a solution to a bag ban with a promotional reusable bag. Opt to create a reusable bag made from a sustainable material, like cotton, jute, or even bamboo. Natural materials are easy to clean which is a great feature for a reusable grocery bag. Consider other materials like polypropylene, which is made from recycled plastic. This material breathes new life into a non-biodegradable material and it makes for a durable reusable bag. Some people prefer or travel mugs to the plastic bottles or paper or Styrofoam cups given out at coffee shops because it gives them the assurance that the vessel is BPA-free and it means less trash will end up in our landfills, or worse yet littering our oceans. Still other people cannot fathom why they would pay for bottled water when they can simply fill a reusable bottle with tap water. Regardless, reusable drink containers are quickly becoming trendy accessories. Even people who do not support the environmental qualities of a reusable coffee mugs and water bottles will still love to snag this giveaway at a conference or tradeshow. As many states contemplate adding plastic water and juice bottles to their bottle bills it can become a hassle for people to dispose of their single use bottles and that can make a reusable bottle all the more appealing. Water bottles and coffee mugs made from stainless steel are easy to clean and will hang in there for years of use. Also consider drink containers made from recycled plastic, they too are easy to clean and they can be recycled when the time comes. Reusable items are just plain handy. Whether used for shopping or the gym or to lug items back and forth to work everyone can find a use for a reusable bag. They may not use them every day, but reusable travel mugs and water bottles offer people the convenience of taking their beverages on the go. Also consider items that are made from recycled materials and items that reduce the amount of trash that ends up in landfills. Each and every time the owner of a reusable item uses it they will be reminded of your brand, but when they take your promotional item on the go you transform your customers into a mobile advertising army that spreads your branding message. This allows you to get the most bang for your buck since you can increase your brand recognition several times over. Just by supplying clients with a thoughtful item that they can use is sure to get you on their good side due to the sheer convenience. Supplying a useful item also indicates to your clients that your company is aware and thoughtful and is making an effort to give them a practical and helpful item. Taking things an extra step and featuring promotional items with a sustainable aspect shows your customers your stance on the environment and conservation. 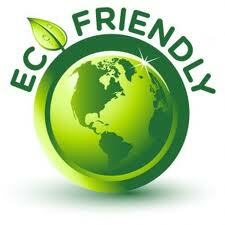 In addition to your brand your eco-friendly item will also spread the idea that your company backs environmental issues. The green movement is gaining in popularity every day and showing those who subscribe to this environmental crusade that your company shares their values will establish a loyal following for your brand. When consumers can identify with a brand and the ideals and principles of the company they are more likely to be faithful to this brand and stick with the company.